Last week, a few more signs were added to a pole outside Linwood E. Howe Elementary school in Culver City, CA to clarify new drop-off and pick-up procedures. No big deal, except now it's 15-feet tall. 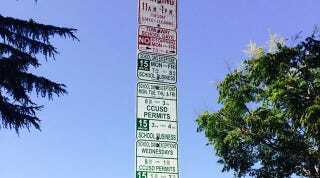 The signs, which covered everything from tow-away zones to permitted parking to the "CCUSD student valet service", were – as you'd expect – a tad confusing. Mayor Meghan Sahli-Wells got involved, and the sign was promptly halved. Except, from what we can tell, the size was cut in half, not the amount of elaborate restrictions. By our count, there are still around 20 different regulations to abide by, which makes this less of a win for parking parents and more the removal of a potential wind hazard. Mayor Sahil-Wells says that the new signs were temporary, but displayed the depth and breath of her leadership to CBS 2, saying, "They just didn't look temporary. So they were going to be taken down. And it looked like … whoa. It was pretty impressive." Before and after below. See if you can spot the fix(es).